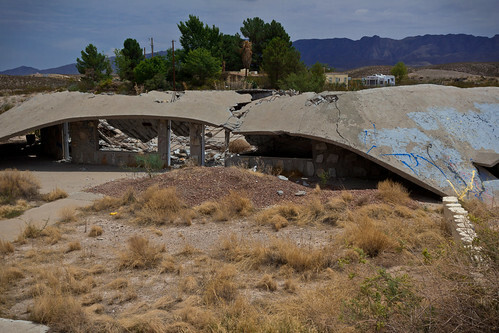 On the outskirts of Canutillo, visible from I-10 is a rather curious structure. 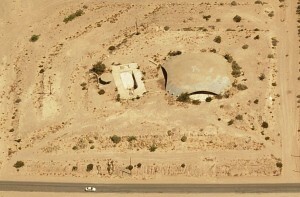 Sitting in the desert is a dome shaped, round concrete house. 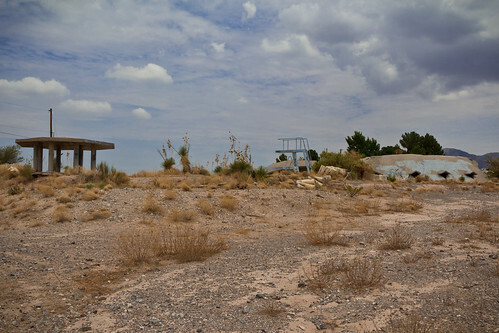 As a kid, I could recall seeing it when we would travel west and it would immediately conjure up images of what living in the “future” must be like. 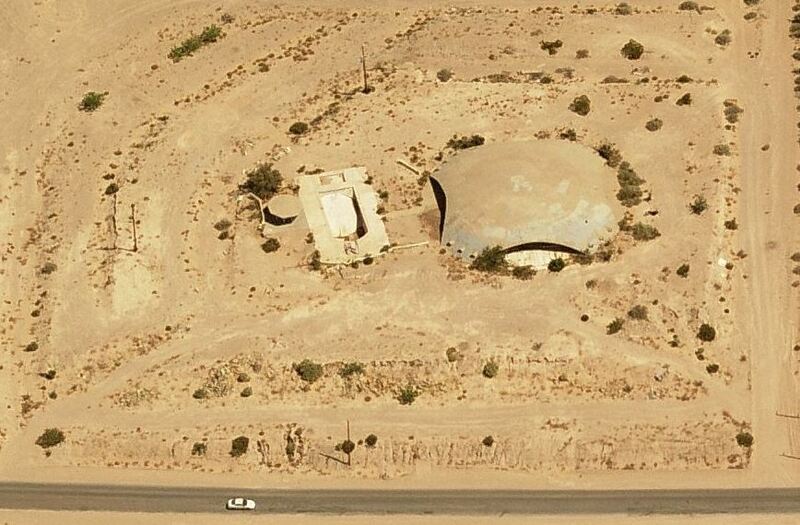 I never got to see the house up close but you easily could see the domed concrete roof, gazebo and diving boards from the freeway. It was right out of an episode of “That’s Incredible” or “Real People”, where they would show some family living off the grid in a solar dome in New Mexico making their own gasoline from corn or something. Hmmm, It didn’t look as fantastic as I remembered but hey its standing. I headed to check it out in person and see what it would be like to live in a future from the 70’s. The site was less Barbarella and more Mad Max. 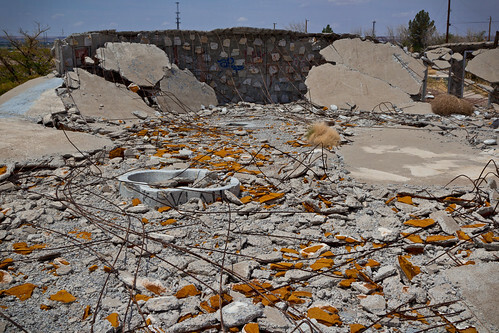 The main house has collapsed on itself and unkempt shrubs and weeds were everywhere. Upon closer inspection you get a sense that the construction was a little less refined than it appeared from afar and whoever built it really liked concrete. Not only was the roof concrete but the exterior walls, gazebo and weird tubular perimeter fence were cement. The interior walls also have rocks embedded in them in a rather haphazard pattern. I couldn’t get a feel for what the interior would have looked like due to the roof collapse. It was apparent that nobody has lived here in a long time. 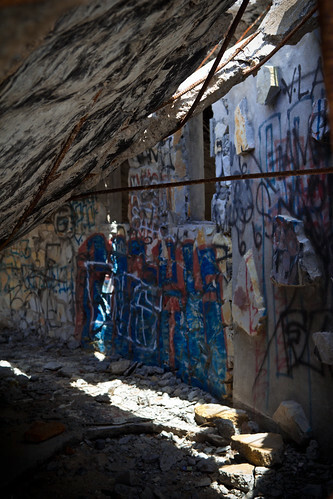 The interior has been stripped and graffiti covers every surface. 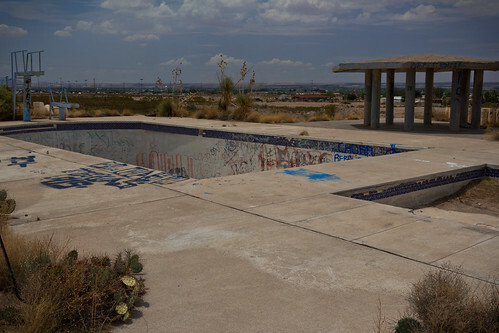 The pool must have been a sight in it’s heyday. You can imagine all manner of 70’s disco parties taking place here; mustaches, corvettes, polyester and cocaine. It would be interesting to know what caused the owners to abandon their hip outpost. Judging by the lack of any insulation, keeping this place cool or hot might have been a chore. Maybe they were bankrupted by the acres of concrete layed in casting this place. One things for sure, you don’t get up and leave your house unmonitored in Canutillo. That’s asking for gangs to move in. It was a bummer seeing this place in such disarray. Much like my fantasy future of geodesic dome living never panned out, it didn’t for the owners here either. The hard truth is given enough time, concrete will crack no matter how much you pour. A bigger walk through is here: This Old Round House.